Today: Gena shares some of her favorite ways to veganize Thanksgiving, and a recipe for stuffing that will satisfy everyone at your table. “What do you eat on Thanksgiving?” is one of the most frequently asked questions about being vegan. Fortunately, the question is easy to answer. Vegan options abound even on the holiday commonly known as “Turkey Day,” and not one of them has to involve Tofurkey. Ah, Tofurkey. It’s the quintessential vegan faux meat, and yet so many vegans -- myself included -- feel that imitating meat on Thanksgiving (or any time, really) is a lot less fun than coming up with new and exciting meat-free dishes. If creating something new isn’t your thing, you can simply work to veganize a lot of your standards. Think about your favorite Thanksgiving dishes -- turkey may be at the top of your list, but you probably also love yams, green beans, Brussels sprouts, and cranberry sauce. Nearly all can be easily adapted to fit a vegan diet; all it takes is a little bit of creative interpretation. Whether you’re hosting a vegan for Thanksgiving this year, or you simply want to try your hand at a meat and dairy-free dish, let me share some of my favorite ideas for a memorable vegan feast. 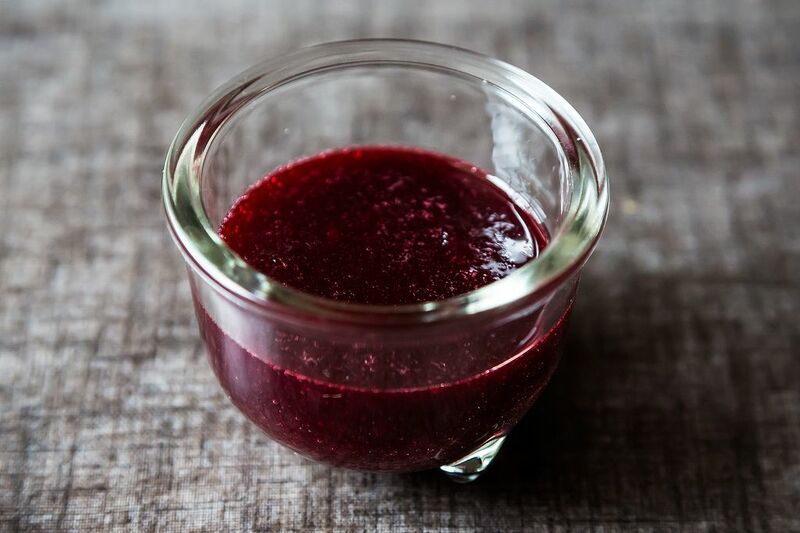 • Cranberry sauce: If you make this with evaporated cane juice or demerara sugar, it’ll be 100% vegan (and you won’t even have to tweak the recipe too much!). • Whipped coconut sweet potatoes: Mash 3 pounds sweet potatoes with a tablespoon or two of coconut oil and coconut cream (the thick part that condenses at the top of a can of coconut milk) along with salt and pepper to taste. Bam! Who said anything about butter? 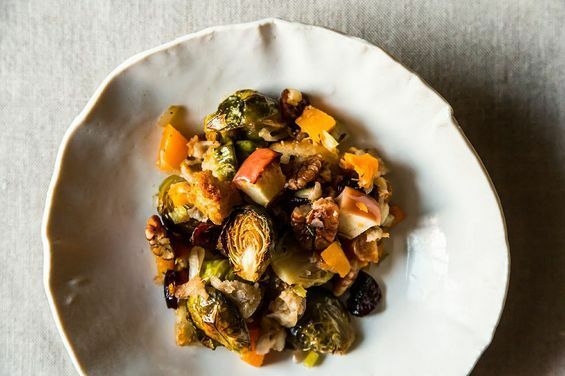 • Brussels sprouts and apples make a terrific vegan side: just roast in olive oil, and there you have it. • Veganize this green bean casserole by using oil in place of butter, and unsweetened non-dairy milk instead of half and half (cashew milk is a good bet for this recipe). • Braised red cabbage—cooked down in apple cider vinegar, a touch of sugar, red wine, salt, and pepper—is a fantastic vegan side dish. • Try stuffing acorn squash with wild rice or another grain of choice. • Consider vegan shepherd’s pie. • Make a giant soup or stew with root vegetables and legumes, and serve with crusty garlic bread. 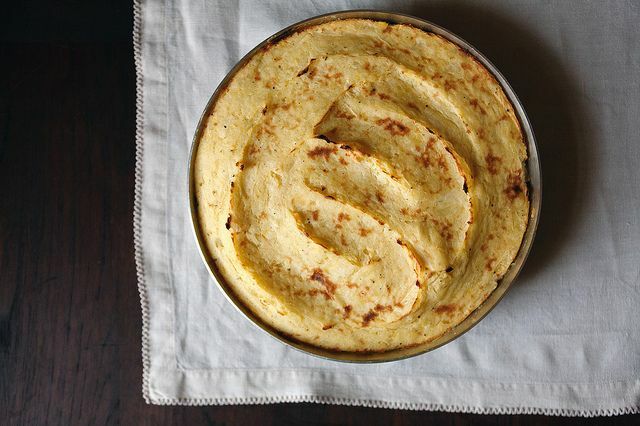 • Try baking a polenta torte, and smothering it in sautéed mushrooms. To make mushroom gravy, simply use oil and non-dairy milk (almond, rice, or soy) in place of butter or regular milk. • If you want to get really ambitious, you can whip up some perfect vegan pie crust and make tofu pot pie—just be sure to use non-dairy milk wherever milk is called for. 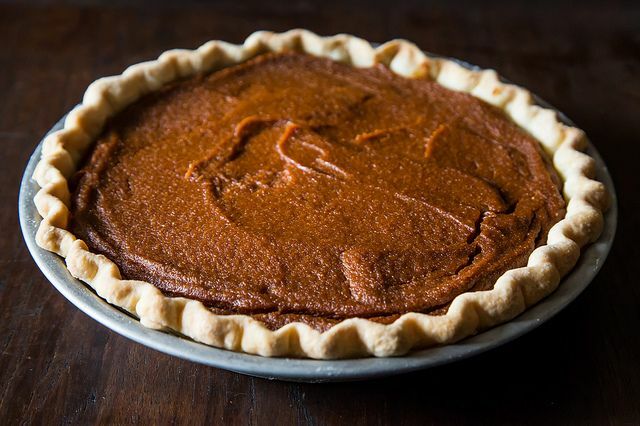 • Now is the ideal time for perfect vegan pie crust and vegan pumpkin pie. • Make a simple apple crumble using coconut oil (at room temperature and solid) in place of butter for the crumble topping. • Try some poached pears with coconut milk in place of cream. • Silken tofu and cocoa powder whip up beautifully with a little agave nectar to make an easy chocolate pudding. And this genius chocolate pudding happens to be vegan, top it with some whipped coconut cream. • Speaking of chocolate, did you know that most dark chocolate (65% or darker) is vegan? And let’s not forget about stuffing. 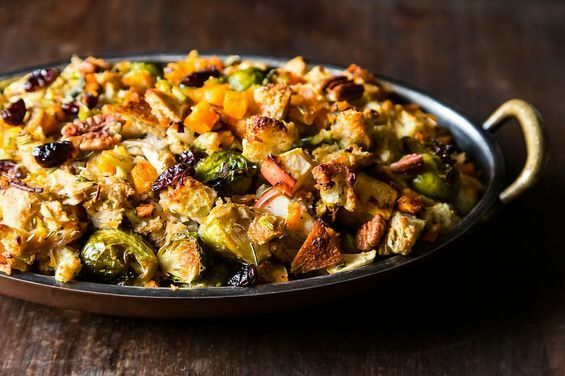 I like a hearty and tasty stuffing as much as the next gal, and I have spent years perfecting a vegan version. The following stuffing was brought to Thanksgiving dinner last year and quickly gobbled up by my omnivore family; I’ve put some finishing touches on it since, but the base (apples, butternut squash, onions, and fresh herbs) has stayed the same. Fragrant, savory sweet, and seasonal, it is the perfect celebratory dish for a holiday that truly does accommodate every way of eating. That looks spectacularly wonderful...I really love brussels sprouts! brussels sprouts INSIDE the stuffing! that sounds so amazing! !